How to find the UUID / UDID (unique identifier) for Apple iPhone, iPod Touch or iPad? Some of our iPhone, iPod Touch or iPad applications are distributed on an Ad-hoc basis. This means that you will receive it by email or can download from our website, but you cannot purchase it via the App Store. We require the UUID or UDID (unique identifier) for the device it will be installed on. This allows the application to run on your device, and prevents copying to other devices (this process automatically happens when you purchase an appplication via the App Store), but for an Ad-Hoc distributed application you need to send us the device UDID. How to find the UDID? 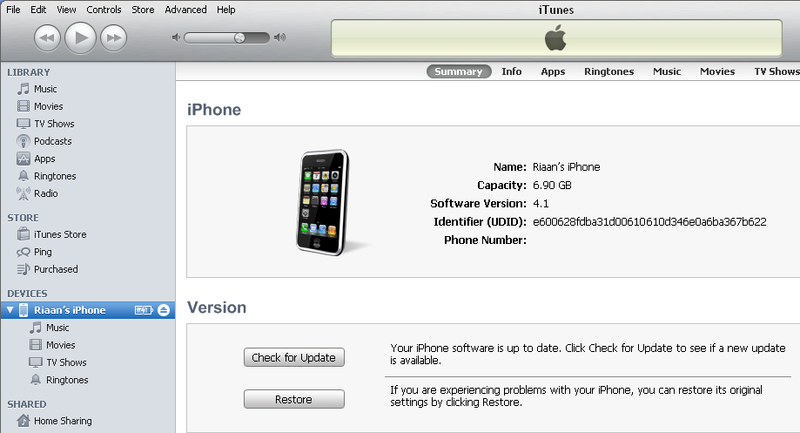 Step 2: Connect your iPhone, iPod Touch or iPad and wait until iTunes list it under “Devices”. Step 6: Check that the code is 40 characters long. Posted in News, General News, Hints & Tips.